Victor is considered to be Kenya’s most successful ever footballer and is currently captain of the national team. 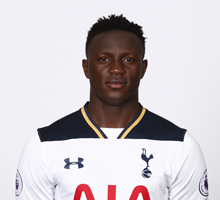 He currently plays in the Premier League as a defensive midfielder with Tottenham Hotspur, having completed a summer transfer from Southampton. Previously he had a successful stint north of the border with former European Champions, Glasgow Celtic, before moving south to join Saints in 2013. Victor has also gone down in history as the first ever Kenyan footballer to score in the UEFA Champions League whilst playing in Scotland against multiple European champions, Barcelona. He has been a tremendous role model to many both in Kenya and Africa in general. Growing up in Nairobi, Victor has had first-hand experience of the challenges that young people in Africa face and of the many who view football as their opportunity to break away from the dire poverty they are faced with. He dedicated himself to football from an early age. At the age of 11, he played for a local team called Country Bus and, together with his team-mates, he would walk for miles in his bare feet to get to away fixtures. Growing up, Victor used Football as a distraction, it allowed him to pass his time and have a focus.